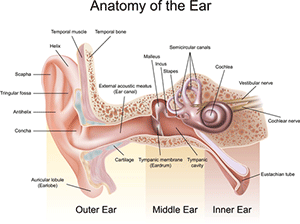 Disorders of the inner ear can cause symptoms such as pain, dizziness or vertigo, nausea, hearing loss and ringing in the ears (called tinnitus). The frequency and severity of symptoms can vary from person to person, but there often is a common link between conditions of the inner ear and problems with the upper cervical spine. Injury or trauma to the neck from car accidents, sports or work-related accidents, or even simply sleeping wrong, can create vertebral misalignments that increase the chances for inner ear diseases. Even minor misalignments can result in nerve irritation that can affect the body in many ways, including causing disorders of the ear. By correcting upper cervical positioning, many patients experience lasting relief from their symptoms. A thorough evaluation by a highly trained upper cervical doctor can determine whether upper cervical care can help with inner ear conditions.